Scroll for a special offer on the Fall & Winter Outfit Guides. For the Spring/Summer Outfit Guide click here. For the Full Year Wardrobe Outfit Guide click here. Instant download. Secure payment. 30-day hassle free guarantee. Secure effortless style as a mom this season. The Outfit Guides for stay-at-home moms hold everything you need to create a smart subdivision of your larger wardrobe. Enjoy countless outfit combinations from pieces carefully planned to offer a balance of timeless and trending styles. Be comfortable while fighting frumpy! Each eBook includes 30 outfit examples. Try different variations of these 30 to reach into the 100's of possible outfits! Plus: 5 Dressy Outfit ideas are included for more formal events. Note: Winter outfit formulas are identical in each Winter eBook, but clothing items differ by the color palette. The free wardrobe checklist is pre-filled with your color palette with room for additional colors. Simply print it out to keep track of what you still need. Easily prioritize what you want to buy. 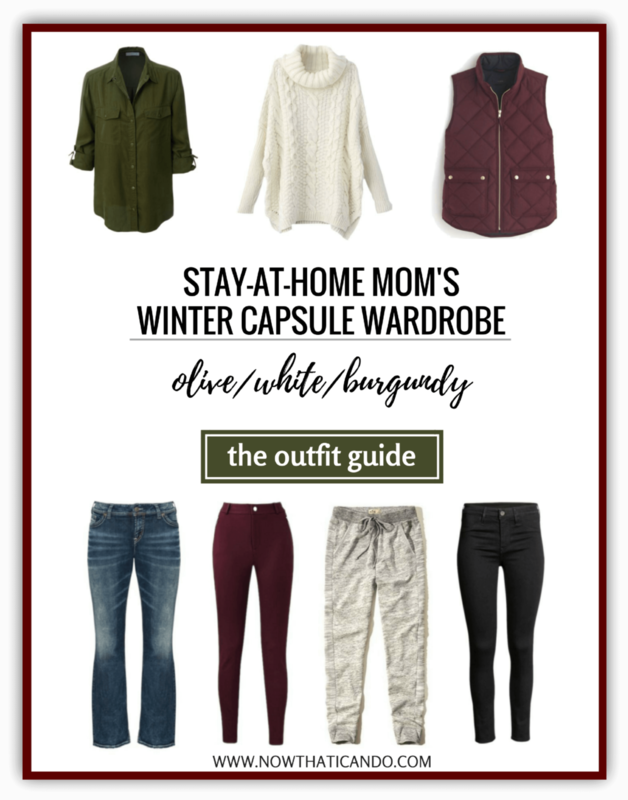 Learn everything you need to know about how to create a usable mom wardrobe. This includes a quick guide to creating all the possible combinations for each capsule. Easily jump to the page (or outfit) you're looking for using the table of contents and index. For each of the 3 guides, you will receive access to a private online gallery of all 30 Outfits. Sort by clothing pieces to instantly locate outfits you want to wear. Swipe through outfits on your phone to choose one in the morning. See how other moms are fighting the frump in the private Facebook group. With the access to the outfit guides, you too can try the Outfit numbers being discussed. Hey! I'm Corina. I created these simple wardrobe plans to make it easier to get dressed in the morning as a mom. Keeping little ones alive and happy really takes all the energy I have! I didn't want to think about what to wear each day. Please remember that I will no longer be able to offer this price after the promotion expires. Regular price will return to $9.99 per outfit guide. Today you can grab all three for just $5 more than the price of ONE outfit guide! 30-day hassle-free refunds: If you are not 100% satisfied with your Outfit Guides I will refund your purchase and you get to keep the guides. Simply email me at corina [at] nowthaticando [dot] com and let me know why you weren't happy with the purchase.